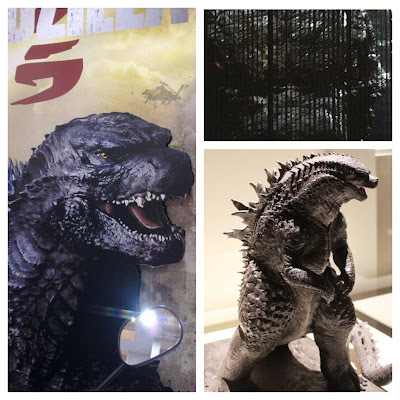 It seems that a Brazilian Gojira fan snapped the above picture of Godzilla's face on a poster for the upcoming Legendary Godzilla Film at a licensing expo in São Paulo (seen on the left). No official confirmation has been made but this does seem to line up with what people saw at the "Godzilla Encounter" at this year's San Diego Comic Con (top right). The eyes look disturbingly human-like and comical to me so I hope its only the angle and he looks meaner when he's revealed in the film. I personally still like the design of the concept statues shown at SDCC 2013 (bottom left).